I’m not one to brag, but I did hit a few out of the park here — back-to-back jacks right off the hop, no less. Of the five Big Lists that I compiled in early September prior to training camps opening, Rookie Sleepers was probably the second-most challenging behind only Busts. Comeback and Breakout candidates were seemingly more predictable based on recent history and my Top 100 Fantasy Defencemen didn’t feature too many surprises either. With Rookie Sleepers, I left out the “obvious” Calder candidates like Jonathan Drouin, Evgeny Kuznetsov, Sam Reinhart and Aaron Ekblad, among others. I went way off the board with some of the My 10 — given all the uncertainty at that time — and even a couple of them have panned out. In comparison to Comeback, Bust and Breakout candidates, after 20 games or 1/4 of the season, this Big List is definitely my biggest success. As per the trend, all of these players are listed in their original order. It’s safe to say Johnny Hockey — aka Johnny Gaudreau — is having a bigger impact in his rookie season than Johnny Football — aka Johnny Manziel. Gaudreau has been an offensive catalyst for the Calgary Flames much like he was for Boston College in winning the Hobey Baker Award as the NCAA’s MVP last season. He’s currently ranking second or third in the Calder Trophy race as the NHL’s rookie of the year. 1) Filip Forsberg (F Nashville) — 20 GP, 9 G, 13 A, 22 PTS = I’ll admit, I didn’t expect him to be a point-per-game player leading the rookie scoring race. How could anyone expect that, when he had previously been unable to stick in the NHL? He’s always been a high-profile prospect, as a former first-rounder who dominated the world juniors, but Forsberg fit the bill of a “sleeper” because Calle Jarnkrok and even Colton Sissons had outperformed him in late-season call-ups. His roster spot was far from assured when I made this Big List, let alone his role on the top line. He’s blowing everybody away and making me look good in the process. 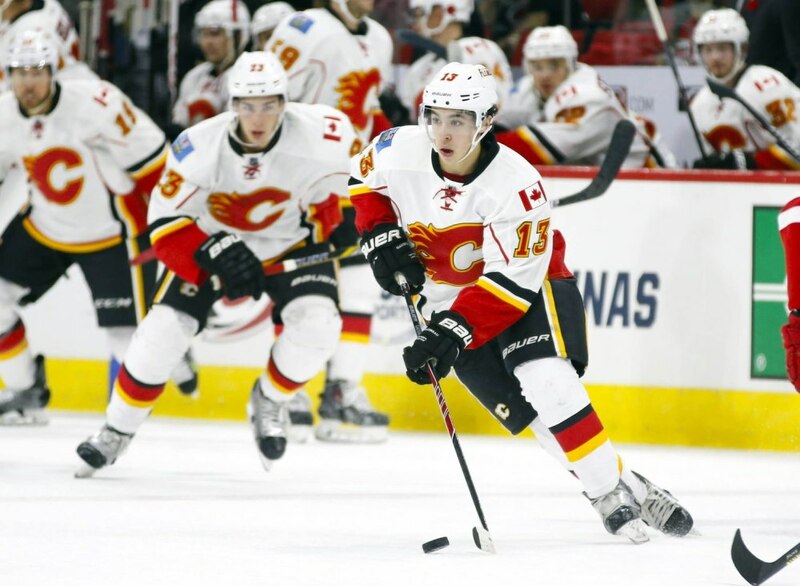 2) Johnny Gaudreau (F Calgary) — 19 GP, 3 G, 10 A, 13 PTS = The little guy’s got big game and Johnny Hockey is only getting better, now second in rookie scoring with 4 goals and 19 points after 25 games. Turns out, he didn’t need any AHL seasoning after all. And he’s not stuck behind Sven Baertschi and-or Devin Setoguchi on the depth chart either. 3) Curtis Lazar (F Ottawa) — 16 GP, 0 G, 6 A, 6 PTS = He was one of those 50-50 guys that either had to make the NHL or go back to junior. He’s not in the WHL and he’s holding his own centering the Sens’ Kid Line with Mike Hoffman and Mark Stone, who are both in the top 10 in rookie scoring. 4) Teuvo Teravainen (F Chicago) — 0 GP, 0 G, 0 A, 0 PTS = The Hawks have had plenty of chances (and reasons) to call this kid up — with injuries to Patrick Sharp and Andrew Shaw, among others — but they are content to let him develop with first-line minutes in the AHL. He’s got 3 goals and 13 points after 20 games down on the farm. 5) Leon Draisaitl (F Edmonton) — 20 GP, 2 G, 3 A, 5 PTS = He had a better than 50 per cent chance of making the team as long as the Oilers didn’t bring in a veteran centre to training camp, which they didn’t. He’s been OK, about what I expected, but he’s also clearly overwhelmed on some nights and probably should be released to the world juniors to dominate against his peers and build his confidence back up. 6) Linden Vey (F Vancouver) — 19 GP, 4 G, 5 A, 9 PTS = The Canucks were high on him when they acquired him from the Kings, suggesting he could help fill Ryan Kesler’s void. That seemed like a stretch and fortunately for Vancouver, Nick Bonino has filled those skates (and then some), but Vey has been pretty decent too. He’s even seen some time on the top power-play unit and is now tied for sixth in rookie scoring with 6 goals and 12 points in 23 games. 7) Derrick Pouliot (D Pittsburgh) — 0 GP, 0 G, 0 A, 0 PTS = He was recovering from shoulder surgery and forced to start his pro career in the minors, where he has impressed with 2 goals and 13 points in 16 AHL games. A call-up could be coming sooner than later. 8) Jiri Sekac (F Montreal) — 13 GP, 3 G, 2 A, 5 PTS = He took a while to get comfortable in North America and gain some chemistry with linemates, but he’s starting to pick up the pace now. He’s up to 4 goals and 8 points in 20 games, which is good for 16th among all rookies. 9) Brandon Gormley (D Phoenix) — 6 GP, 1 G, 0 A, 1 PTS = I assumed he’d make the Coyotes out of training camp, which he didn’t. He earned a call-up but unfortunately got hurt in the same game he celebrated his first career goal and has been sidelined since. 10) Anders Lee (F N.Y. Islanders) — 14 GP, 3 G, 1 A, 4 PTS = Same here, with the way he finished last season, Lee seemed like a lock to make the Islanders, albeit in a depth role with the additions of Mikhail Grabovski and Nikolay Kulemin. But he did make the opening-night roster and to do another brief AHL stint. He hasn’t been scoring much since being recalled, although he is up to 5 goals in 19 games, which would equate to 22 over 82. 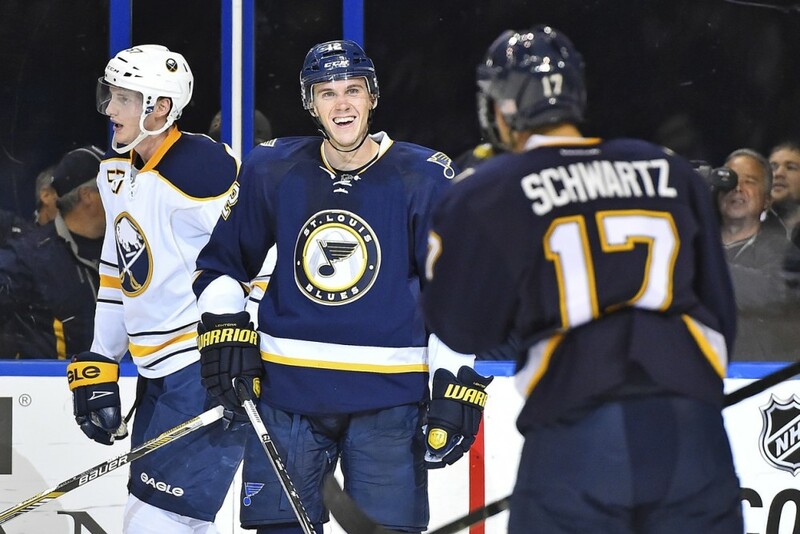 Jori Lehtera, middle, has had plenty of reasons to smile since joining the St. Louis Blues this season. A relative unknown to North American fans, Lehtera’s been reunited with former KHL linemate Vladimir Tarasenko and they have been pretty much unstoppable, with Jaden Schwartz rounding out that trio. 1) Alexander Khokhlachev (F Boston) — 0 GP, 0 G, 0 A, 0 PTS = He’s since played 3 games but been held pointless. I had him pegged for the role that went to fellow AHL call-up Seth Griffith. Khokhlachev could still make an impact later in the season. He’s not far off. 2) Jori Lehtera (F St. Louis) — 19 GP, 7 G, 12 A, 19 PTS = Turning 27 later this month, he’s technically not a rookie but still a newcomer to the NHL. And what a debut he’s made as a point-per-game players on the Blues’ most productive line. If you don’t know him by name yet, shame on you. 3) Nicolas Kerdiles (F Anaheim) — 0 GP, 0 G, 0 A, 0 PTS = The Ducks are a hard team to crack and he was unable to do it, competing against a couple other rookies for the third-line centre vacancy. But he’s been doing just fine in his first full pro season, putting up 5 goals, 12 points and 29 penalty minutes in 21 AHL games. 4) Andre Burakovsky (F Washington) — 20 GP, 3 G, 9 A, 12 PTS = He’s since scored his 4th goal and is tied for 3rd in rookie scoring. He’s been far outshining the aforementioned Kuznetsov, which is surprising. Burakovsky was a big story early on, with 2 goals and 5 points in his first 4 games, but nobody expected him to maintain that torrid pace. Still, he’s been putting up good numbers for a guy that jumped straight from the OHL to the NHL. 5) Brett Ritchie (F Dallas) — 0 GP, 0 G, 0 A, 0 PTS = Coming off a big 22-goal, 48-point AHL season, I thought he’d be ready to make the jump. When Valeri Nichushkin went down to hip surgery, I figured for sure he’d get the call. But Curtis McKenzie (8-1-0-1) has been going back-and-forth instead. Ritchie isn’t necessarily beating down the door with only 3 goals and 7 points in 12 AHL games so far. 6) Ryan Sproul (D Detroit) — 0 GP, 0 G, 0 A, 0 PTS = He’s not having a very good season at all, with only 1 goal and 2 points (not to mention a minus-7 rating) in 16 AHL games. He has a high offensive ceiling, but he might end up being trade bait for the Red Wings. 7) Joel Armia (F Buffalo) — 0 GP, 0 G, 0 A, 0 PTS = He’s pushing for a call-up, with 6 goals and 15 points in 19 AHL games. He only had 7 goals and 27 points in 54 games last season, his first in North America. 8) Shayne Gostisbehere (D Philadelphia) — 2 GP, 0 G, 0 A, 0 PTS = He was pressed into action by a rash of injuries to Flyers defencemen, then suffered a torn ACL that required surgery and will sideline him until late February. He had 5 assists in 5 AHL games to start his pro career, so the upside is definitely there. 9) Tobias Rieder (F Arizona) — 10 GP, 1 G, 2 A, 3 PTS = He has since scored 2 shorthanded goals in the same penalty kill of the same game, bringing his totals to 4 goals and 7 points in 16 games, which has him in the top 20 for rookie scoring. Like Lehtera, he’s a guy the casual fan had probably never heard of. 10) Jussi Rynnas (G Dallas) — 0 GP, 0 W, 0 GAA , 0 Save% = He just got the call-up as I was writing this, swapping with Anders Lindback in what could be permanent promotion if he performs well behind Kari Lehtonen, who has also been struggling to some extent. Rynnas has been solid in the AHL, posting 5 wins and only 1 loss in 10 appearances with a 2.58 GAA and .913 save percentage. This is his time to shine. Rickard Rakell, F — 14 GP, 0 G, 3 A, 3 PTS = He’s been in and out of the lineup, taking turns with fellow rookie William Karlsson (16-2-1-3), though neither has been able to establish themselves as permanent fixtures. Lucas Lessio, F— 1 GP, 0 G, 0 A, 0 PTS = He’s got 5 goals and 9 points in 15 AHL games but, turning 22 in January, he’s at risk of becoming a career minor-leaguer. Greg Carey, F— 0 GP, 0 G, 0 A, 0 PTS = He’s only got 1 goal and 2 points in 12 AHL games, so he’s not worth monitoring at this time. Tyler Gaudet, F — 0 GP, 0 G, 0 A, 0 PTS = He’s got 3 goals and 6 points in 21 AHL games, but there would appear to be at least a few forwards ahead of him for call-ups. Emile Poirier, F — 0 GP, 0 G, 0 A, 0 PTS = He missed training camp with an injury but has been very impressive since returning to action, recording 5 goals and 12 points in 13 AHL games. If he keeps that up, he might get the call after Christmas. Markus Granlund, F — 9 GP, 3 G, 5 A, 8 PTS = Here’s a guy who got the call and made the most of his opportunity. He’s actually been outperforming his more highly touted brother Mikael of the Minnesota Wild. Markus has slowed down since this cutoff, with only 1 assist in his last 6 games. Michael Ferland, F — 1 GP, 0 G, 0 A, 0 PTS = He suffered a concussion in his NHL debut but is back in action now, having played 7 games and recently recorded his first NHL point, an assist. Ferland overcame some off-ice drama and some perceived attitude issues but has potential to be the next Milan Lucic if he can channel his emotions and chip in some more offence. Tyler Wotherspoon, D— 0 GP, 0 G, 0 A, 0 PTS = Calgary’s defence has been its strength, and this trio hasn’t had a sniff as a result. Wotherspoon has 1 goal and 8 points in 19 AHL games. Patrick Sieloff, D — 0 GP, 0 G, 0 A, 0 PTS = He only has 1 assist in 14 AHL games, but he’s got 40 penalty minutes, which is more indicative of his playing style. Brett Kulak, D — 0 GP, 0 G, 0 A, 0 PTS = He’s in the ECHL, so nowhere near the NHL in other words. Adam Clendening, D — 2 GP, 1 G, 1 A, 2 PTS = He scored his first career goal in his first career game and got his first assist in his second game, but after two pointless games since this cutoff, he served as a healthy scratch and could be headed back to the minors when the Hawks get healthy on defence. Trevor van Riemsdyk, D — 18 GP, 0 G, 1 A, 1 PTS = It was a surprise to see him make the team out of training camp but just as he getting into a groove, he suffered a broken leg that will keep him out for a few months. Dennis Rasmussen, F — 0 GP, 0 G, 0 A, 0 PTS = He was an older Euro (24) that had a chance to challenge for a roster spot but missed the cut. He’s got 5 goals and 9 points in 22 AHL games. Joey Hishon, F — 0 GP, 0 G, 0 A, 0 PTS = It didn’t sound like he had a very good training camp and might have been surpassed by rookie forward Dennis Everberg (13-1-3-4). Hishon has been just OK in the AHL, with 5 goals and 9 points in 17 games. 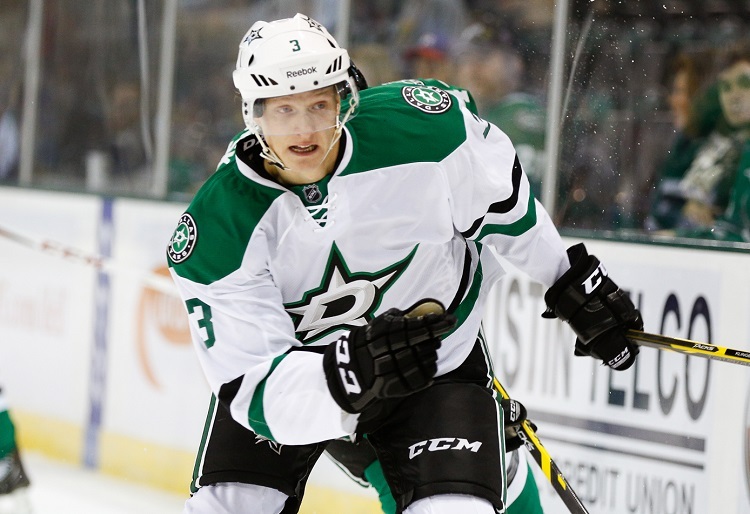 John Klingberg has been nothing short of sensational for the Dallas Stars. He’s taken full advantage of his call-up and has everybody taking notice thanks to his eye-popping offensive statistics for a rookie defenceman. John Klingberg, D — 6 GP, 1 G, 3 A, 4 PTS = As far as Rookie Sleepers go, this former 5th-round pick might be the best of the bunch. I’m glad I had him on my Big List but he definitely belongs in the Top 10 at this point. He’s up to 3 goals and 9 points in 11 games and is playing as the lone defenceman on the Stars’ top power-play unit. Bogdan Yakimov, F — 1 GP, 0 G, 0 A, 0 PTS = He was a big surprise in the Young Stars rookie tournament and nearly made the team out of training camp but he hasn’t been dominating the AHL by any means with only 1 goal and 6 points after 15 games. Dillon Simpson, D — 0 GP, 0 G, 0 A, 0 PTS = He’s only got 2 goals in 18 AHL games, so he’s still adjusting to the pro game and may not get a cup of coffee this season. Jordan Weal, F — 0 GP, 0 G, 0 A, 0 PTS = He could be the next Linden Vey or Brandon Kozun, a guy who needs to get out of L.A.’s deep prospect pool to establish himself elsewhere. For now, he’s a point-per-game guy in the AHL with 8 goals and 18 points in 20 games. Nick Ebert, D — 0 GP, 0 G, 0 A, 0 PTS = He’s got 1 goal and 3 points in 11 AHL games and has got a long way to go to get to the NHL. Christian Folin, D — 8 GP, 0 G, 0 A, 0 PTS = He just logged his first assist (and point) of the season in his 10th game, but it doesn’t appear he’s going to be a fantasy impact guy any time soon. Michael Keranen, F — 0 GP, 0 G, 0 A, 0 PTS = The Wild are deep up front but he may be next in line for a call-up. The soon-to-be 25-year-old Finn has 4 goals and 16 points in 21 AHL games, second in scoring for Minnesota’s farm team. Calle Jarnkrok, F — 16 GP, 1 G, 3 A, 4 PTS = He’s not racking up the points yet, but he’s centering the second line with Craig Smith and Colin Wilson, so the offence should start coming soon. He’s obviously playing in the shadows of Forsberg at this point. Colton Sissons, F — 0 GP, 0 G, 0 A, 0 PTS = The Preds have even more forward depth than the Wild and Sissons is stuck in the minors now after a brief-but-solid NHL showing last season (17-1-3-4). He’s got 6 goals but no assists in 20 AHL games this season. Mirco Mueller, D — 17 GP, 1 G, 2 A, 3 PTS = He made the team out of training camp and that was a surprise in itself to some. It was about 50-50 that he’d stick in the NHL over returning to the NHL, and he’s outperformed his stats by most accounts, although he’s been a healthy scratch more recently. Taylor Fedun, D — 0 GP, 0 G, 0 A, 0 PTS = He’s in the minors and not doing a whole heck of a lot. Chris Tierney, F — 11 GP, 0 G, 2 A, 2 PTS = Like Mueller, just cracking the opening-day roster was a surprise, but he’s since been demoted to the AHL for more seasoning. The offensive potential is there for the future. Barclay Goodrow, F — 7 GP, 0 G, 1 A, 1 PTS = He’s still on the roster and recently recorded his first NHL point, which is shocking to say the least for an undrafted free-agent signing. He’s got pretty good versatility as far as the roles he’s capable of filling, and the fact he made the cut was one of the bigger surprises among rookies this season. I’ll go ahead and pat myself on the back for his inclusion in this Big List. Dmitrij Jaskin, F — 6 GP, 1 G, 0 A, 1 PTS = He’s another depth victim, but he’s putting up good numbers in the AHL again since his demotion, with 3 goals and 12 points in 15 games. Ty Rattie, F — 0 GP, 0 G, 0 A, 0 PTS = He’s a sniper to keep an eye on, leading the farm team with almost twice as many goals as anybody else (13 to 7). With only 2 assists, he was at 15 points after 24 games. Bo Horvat, F — 7 GP, 1 G, 0 A, 1 PTS = He’s since picked up 4 assists, including 3 in the same game, setting up each goal of Jannik Hansen’s hat trick. Horvat is playing bottom-six minutes but fitting in quite well, with 5 points after 13 games. Hunter Shinkaruk, F — 0 GP, 0 G, 0 A, 0 PTS = Vancouver’s farm team is topping the AHL standings, but his offensive skill-set is taking some time to translate to the pro game, with 4 goals and 9 points after 24 games. Brendan Gaunce, F — 0 GP, 0 G, 0 A, 0 PTS = Same here, with 1 goal and 8 points after 24 games in his first pro season, although his ceiling isn’t as high as Shinkaruk’s. Michael Hutchinson is leading the entire NHL in both goals-against average (1.62) and save percentage (.943). 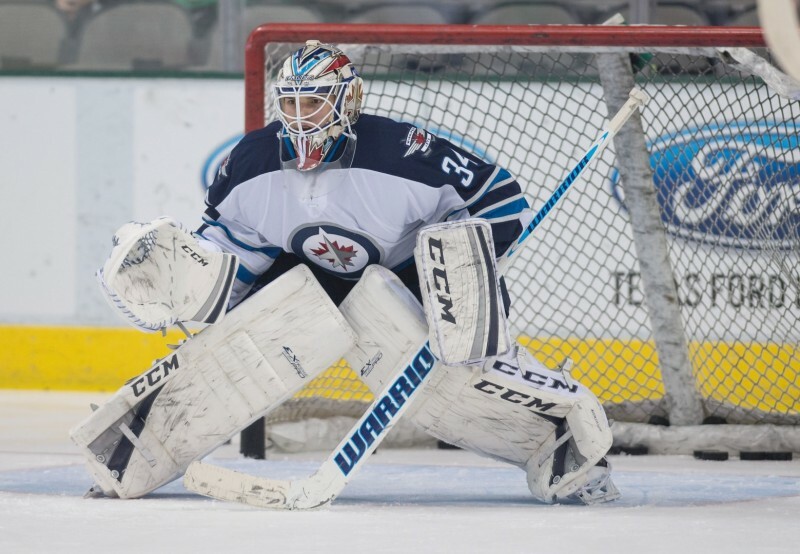 Yes, Michael Hutchinson, the Winnipeg Jets’ backup goaltender who many had never heard of prior to this season. Michael Hutchinson, G — 4 GP, 3 W, 1.38 GAA , .948 Save% = Calder candidate? Don’t laugh, his numbers have been good enough to warrant consideration. If he steals more starts, or if starter Ondrej Pavelec was to get hurt, Hutchinson could work his way into the conversation. He’s now won 5 of his 7 starts, with a 1.62 GAA and .943 save percentage, which are both tops in the league right now. Brenden Kichton, D — 0 GP, 0 G, 0 A, 0 PTS = He’s not having the same offensive success as last season, with only 3 goals and 7 points after 25 games, which might explain why the Jets called up Ben Chiarot (24-4-5-9) over Kichton with Tobias Enstrom, Zach Bogosian and Grant Clitsome all sidelined. That said, Kichton has more potential and should get a look soon. Nic Petan, F — 0 GP, 0 G, 0 A, 0 PTS = He was one of Winnipeg’s last cuts but got off to a slow start back in the WHL where he’s already had two 100-plus-point seasons. He has since picked up the pace with the Portland Winterhawks, now at 6 goals and 31 points after 24 games as their captain. Adam Lowry, F — 20 GP, 1 G, 1 A, 2 PTS = He’s since scored his 2nd career NHL goal and has 3 points after 26 games, but he’s been pretty effective in a checking role. His size (6-foot-5) and skating ability should keep him in the NHL for a long time. Scott Kosmachuk, F — 0 GP, 0 G, 0 A, 0 PTS = Another first-year pro that is finding it tougher to score than in junior. Coming off a 49-goal, 101-point OHL season, he had only 2 goals and 5 points after 24 AHL games. Some seasoning and patience is required with him. David Pastrnak, F — 0 GP, 0 G, 0 A, 0 PTS = He’s since been called up and just earned his 1st NHL point, an assist, in his 5th game. He had 5 goals and 18 points in 17 AHL games, so the upside is huge for this first-round pick in 2014. Matt Fraser, F — 12 GP, 2 G, 0 A, 2 PTS = He’s since scored his 3rd goal through 17 games, but he’s been a healthy scratch on several occasions too. He’ll be a bottom-six player for most of his career it seems. Joe Morrow, D — 9 GP, 0 G, 0 A, 0 PTS = The Bruins’ blue-line has been decimated by injuries, which has provided unexpected opportunity for this trio. Morrow has good offensive upside and has since scored his 1st career NHL goal but only has the 1 point after 14 games. David Warsofsky, D — 4 GP, 0 G, 1 A, 1 PTS = He has since been returned to the minors with the return of Torey Krug. Warsofsky is an undersized puck-mover who can quarterback a power play, but he’s a long-shot to become an NHL regular. Zach Trotman, D — 9 GP, 0 G, 2 A, 2 PTS = He has 3 assists now through 12 games but will likely be sent down when captain Zdeno Chara returns as early as next week. Jake McCabe, D — 0 GP, 0 G, 0 A, 0 PTS = He’ll eventually be an NHL player, perhaps coming up after Christmas. He’s been good in the AHL with 2 goals and 7 points after 19 games in his first full pro season. Nikita Zadorov, D — 9 GP, 0 G, 1 A, 1 PTS = He still only has 1 assist after 15 games, but he’s been paired with fellow youngster Rasmus Ristolainen (26-1-3-4) to give Sabres fans a glimpse of the future. Their stats might not show it, but that pairing is the envy of most other teams. Nicolas Deslauriers, F — 20 GP, 2 G, 3 A, 5 PTS = He was drafted as a defenceman but has been pretty effective up front. He’s added another assist and had 6 points after 26 games, which had him tied for 6th in team scoring on the low-scoring Sabres. Brock McGinn, F — 0 GP, 0 G, 0 A, 0 PTS = Younger brother to Jamie and Tye but maybe the best of the three, Brock had 5 goals and 9 points after 19 AHL games as a rookie pro. He might earn a cup of coffee later this season. Chris Terry, F — 17 GP, 4 G, 3 A, 7 PTS = He was a pleasant early-season surprise but then got hurt. He’s just now returning from a conditioning stint in the minors, so it will be interesting to see whether he can secure a roster spot again with the Hurricanes being healthier up front. Alexander Wennberg, F — 19 GP, 0 G, 3 A, 3 PTS = He was forced into the fire ahead of schedule because of injuries and played 21 games but has since been sent down to the AHL, which is where he should probably stay for the rest of the season. He’ll develop into a pretty good player over time. Jerry D’Amigo, F — 0 GP, 0 G, 0 A, 0 PTS = He’s got 3 goals and 7 points after 24 AHL games. He was acquired in the off-season for Matt Frattin and both are looking like busts. Scratch D’Amigo off your Rookie Sleeper list. Simon Hjalmarsson, F — 0 GP, 0 G, 0 A, 0 PTS = He failed to make Columbus out of training camp then refused to report to the AHL. He’s now in the KHL and putting up impressive numbers with 7 goals and 12 points in 11 games. Don’t totally forget about him in case he finds his way back across the pond next year. Petr Mrazek, G — 1 GP, 1 W, 3.00 GAA , .903 Save% = Jimmy Howard is carrying the load but Mrazek is now 2-for-2 winning in relief, albeit with a 3.36 GAA and .875 save percentage. He’s been called up while Jonas Gustavsson is sidelined by injury, so he’ll inevitably be heading back to the AHL but Mrazek is the future in goal for Detroit. Teemu Pulkkinen, F — 0 GP, 0 G, 0 A, 0 PTS = He’s going to be a good NHL player sooner than later, the latest and greatest diamond in the rough for Detroit. He’s got 10 goals and 24 points after 20 AHL games this season. Tomas Nosek, F — 0 GP, 0 G, 0 A, 0 PTS = He had 2 assists after 4 AHL games but hasn’t played since, so consider Nosek still something of a mystery for now. 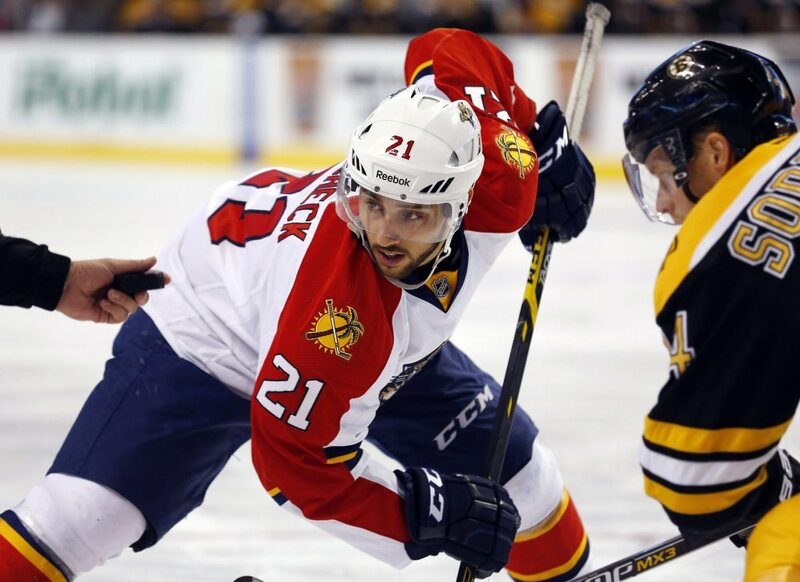 Vincent Trocheck, left, is earning his keep with the Florida Panthers by piling up the points at a pretty steady clip. He doesn’t scream future star when you watch him, but he’s finding the scoresheet on a regular basis lately. Vincent Trocheck, F — 11 GP, 1 G, 5 A, 6 PTS = He’s been lighting it up, with 2 goals and 11 points after 15 games, which had him tied for 8th in rookie scoring but in way fewer games. It’s doubtful he’ll climb high enough to join the Calder race, but he should be staying in Florida for the long haul now. Alex Petrovic, D — 0 GP, 0 G, 0 A, 0 PTS = He’s not far off from being an NHL player, with 2 goals and 12 points after 20 AHL games. He’s played a combined 13 games over the past 2 seasons and will probably be summoned again at some point this season. Rocco Grimaldi, F — 7 GP, 1 G, 0 A, 1 PTS = His stats aren’t great even in the AHL, with 3 goals and 7 points after 16 games, but the Panthers really liked what they saw from him in his brief NHL stint and are said to be trying to trade veteran forwards to make room for him. He’s a small energy player, quite similar to Nathan Gerbe but with more scoring upside. Magnus Nygren, D — 0 GP, 0 G, 0 A, 0 PTS = The Swedish league’s player of the year last season is making a smooth transition to North America, with 4 goals and 10 points after 15 games. Montreal is pretty deep on defence, but he could be in the mix by the end of this season. Dustin Tokarski, G — 4 GP, 3 W, 1.78 GAA , .937 Save% = He’s proving to be a capable backup for Carey Price, but his play has dipped a little since this cutoff. Tokarski is stuck on 3 wins after 6 starts with a 2.44 GAA and .914 save percentage. Patrick Holland, F — 0 GP, 0 G, 0 A, 0 PTS = He was a throw-in in the Peter Budaj trade to Winnipeg that gave Tokarski the backup role. Holland was pointless in 7 AHL games and hasn’t played since. Keith Kinkaid, G — 2 GP, 0 W, 2.22 GAA , .909 Save% = He twice relieved Cory Schneider during his record streak of starts but has since been sent back to the minors, swapping with veteran Scott Clemmensen to get more playing time. In 12 AHL games, he’s got 7 wins with a 2.29 GAA and .920 save percentage. He should be the Devils’ full-time backup next season. Reid Boucher, F — 3 GP, 0 G, 0 A, 0 PTS = He’s not having a great season, perhaps falling victim to the sophomore slump as a second-year pro. He only has 3 goals and 8 points after 18 AHL games. Damon Severson, D — 20 GP, 4 G, 4 A, 8 PTS = Ding, ding! He might be the biggest Rookie Sleeper of them all. Sure, the offence has slowed down, still stuck on 4 goals but up to 10 points after 26 games, but this is a guy that wasn’t even expected to be in the NHL. He was a long-shot to crack the Devils’ roster but has been a mainstay in the lineup since opening night. Myles Bell, F — 0 GP, 0 G, 0 A, 0 PTS = He’s stuck in the ECHL for the time being but has 8 goals and 14 points after 18 games, so he should get called up to the AHL at some point. That said, he’s a long way from the NHL as a rookie pro. Ryan Pulock, D — 0 GP, 0 G, 0 A, 0 PTS = He just got called up but never actually got to make his NHL debut, but that is a sign that he’s next in line. He’s been real good as a rookie pro, with a team-leading 8 goals and 13 points after 20 AHL games. Josh Ho-Sang, F — 0 GP, 0 G, 0 A, 0 PTS = He didn’t make the team out of training camp but has continued to be one of the OHL’s dynamic talents despite not getting invited to Canada’s selection camp for the world juniors. He was traded in the OHL early on and has a combined 4 goals and 25 points after 20 games. Kevin Hayes, F — 17 GP, 2 G, 4 A, 6 PTS = He’s up to 3 goals and 8 points after 21 games and seems to be securing a regular role with the Rangers. He’s a big body with a good set of hands, which explains why he was sought after as a college free agent in the summer and why the Blackhawks had originally drafted him in the first round. Dylan McIlrath, D — 1 GP, 0 G, 0 A, 0 PTS = He got into a fight in his only game, which is a part of his game as a big, mean blue-liner. He only has 3 assists after 20 AHL games but leads his team with 45 penalty minutes. If his skating can get to a competent level, he could still have an NHL future. Oscar Lindberg, F — 0 GP, 0 G, 0 A, 0 PTS = He’s having another good AHL season (22-8-7-15), which means his NHL debut can’t be far off. He’s 23 so he could be mature enough to make the most of that opportunity when it comes. Mat Bodie, D — 0 GP, 0 G, 0 A, 0 PTS = He’s a team-worst minus-6 in the minors, but he’s been providing offence from the back end as a rookie pro, with 2 goals and 12 points in 22 AHL games. Does he have an NHL future? Time will tell. Petr Zamorsky, D — 0 GP, 0 G, 0 A, 0 PTS = He didn’t end up coming over and is playing this season in Finland, where he has 1 goal and 3 points after 15 games but is also minus-6. He can probably be removed from this list for the time being. Mark Stone, F — 19 GP, 5 G, 5 A, 10 PTS = He’s since added another assist for 11 points after 24 games, but he’s been slowing down on offence as Ottawa’s kid line with Hoffman and Lazar has been shut down lately. Robert Hagg, D — 0 GP, 0 G, 0 A, 0 PTS = In the midst of his first full season in North America, he’s got 2 goals and 10 points after 20 AHL games. That’s decent, but his development is ongoing. Jason Akeson, F — 12 GP, 0 G, 0 A, 0 PTS = He was a scoring machine in years past, with 2 points in 2 career NHL games, but he couldn’t find the back of the net this season and was eventually sent down. He might have a hard time finding his way back to the NHL. Pierre-Edouard Bellemare, F — 20 GP, 3 G, 1 A, 4 PTS = He’s stuck on 4 points after 24 games and has been a healthy scratch more recently. The 29-year-old Frenchman is still quite the story, having been an under-the-radar signing who cracked the Flyers out of training camp. Kasperi Kapanen, F — 0 GP, 0 G, 0 A, 0 PTS = He nearly made the team but ultimately went back to Finland, where he’s already surpassed his point total from last season. Kapanen is now a point-per-game player (16-9-7-16) after putting up 7 goals and 14 points in 47 games during his draft year. Josh Archibald, F — 0 GP, 0 G, 0 A, 0 PTS = He’s only got 2 goals and 4 points after 12 AHL games, so he’s not exactly knocking at the door just yet. The Penguins really need a winger prospect like him to pan out. Kristers Gudlevskis, G — 0 GP, 0 W, 0 GAA , 0 Save% = He’s splitting time with top prospect Andrei Vasilevskiy in the AHL, but both of them are struggling after 11 games each. Gudlevskis has more wins with 7 but worse stats with a 3.24 GAA and .892 save percentage. Vladislav Namestnikov, F — 20 GP, 3 G, 4 A, 7 PTS = He just got sent back down to the AHL after 23 total games, but he’ll be back in the NHL at some point. It’s just he was stuck playing bottom-six minutes on a team deep with young talent, so Namestnikov will need to bide his time for a bit longer. Adam Erne, F — 0 GP, 0 G, 0 A, 0 PTS = He’s ripping it up in the QMJHL, with 20 goals and 42 points after 25 games. He wasn’t close to making the NHL cut this fall, but he’ll be one to watch for next season. Petri Kontiola, F — 0 GP, 0 G, 0 A, 0 PTS = He busted . . . AGAIN! This is probably the last we’ll see of him in NHL circles, having missed the cut with the Maple Leafs then failing to record a point in 11 AHL games with the Marlies before packing up and heading home. He’s got 2 assists in 2 KHL games since getting back there. Josh Leivo, F — 7 GP, 1 G, 0 A, 1 PTS = He was sent back down to the Marlies after playing 8 games and he has 1 goal and 7 points in 12 AHL games this season. He’s certainly on the radar for another call-up, but full-time employment in the NHL will be difficult to secure this season. Greg McKegg, F — 0 GP, 0 G, 0 A, 0 PTS = These next two guys might get a cup of coffee at some point too, as both are enjoying strong AHL seasons as the Marlies’ leading scorers. McKegg is tops in goals, with 7, and second in points with 12 in 17 games. Connor Brown, F — 0 GP, 0 G, 0 A, 0 PTS = The OHL’s leading scorer from last season clearly wasn’t riding the coat-tails of former teammate Connor McDavid, as Brown’s offensive prowess has carried over to the AHL. He is the Marlies’ top point-getter with 15, including 5 goals, after 22 games. Philipp Grubauer, G — 0 GP, 0 W, 0 GAA , 0 Save% = He’s been one of the AHL’s top goalies, as expected, and could be a solid fill-in should Braden Holtby or Justin Peters get hurt. Grubauer has won 9 of his 16 games with a 2.11 GAA and .911 save percentage. Madison Bowey, D — 0 GP, 0 G, 0 A, 0 PTS = He’s been great for the WHL-leading Kelowna Rockets, with 8 goals, 33 points and a plus-20 rating after 27 games. Watch for him to be an impact player for Canada at the world juniors and use that performance as a springboard to NHL success as early as next season. He could be Washington’s replacement for pending free agent Mike Green. 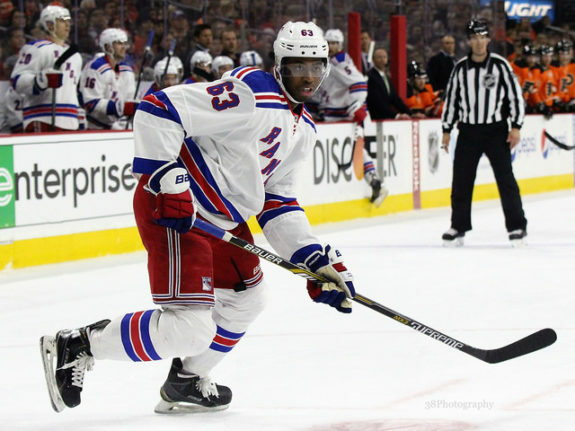 Anthony Duclair went from exciting prospect to everyday player for the New York Rangers this season, surprisingly sticking on their roster rather than returning to junior. Anthony Duclair (F N.Y. Rangers) — 15 GP, 1 G, 6 A, 7 PTS = He’s a fun player to watch, definitely noticeable on most of his shifts. He was another NHL or junior decision and most assumed he’d be back in the QMJHL. But he had a great camp and earned the right to stick around past his 9-game trial. There is still a chance he could be assigned to Team Canada for the world juniors, so that is a situation worth monitoring, and whether he returns to New York after that tournament. Seth Griffith (F Boston) — 16 GP, 5 G, 2 A, 7 PTS = He rode a nice little hot streak to rack up that point total while playing alongside David Krejci and Milan Lucic on the top line after a few regulars failed to stick in Jarome Iginla’s old spot. Griffiths has since went pointless in his last 5 games and could be sent back to the minors if he doesn’t start producing again. Josh Jooris (F Calgary) — 13 GP, 4 G, 3 A, 7 PTS = This guy has been a revelation. He’s a late bloomer at 24 years old, but he’s up to 8 goals and 12 points after 21 games, including a hat trick that nobody could have predicted prior to the season. On a surprising team, he’s been the biggest surprise. Victor Rask (F Carolina) — 20 GP, 3 G, 2 A, 5 PTS = When Jordan Staal went down to a broken leg in the pre-season, Rask made the most of his chance to secure a roster spot. Without that injury, he likely would have started the season in the AHL, but now it seems the second-year pro might never see the minors again as he’s up to 4 goals and 9 points after 25 games. Kerby Rychel (F Columbus) — 3 GP, 0 G, 3 A, 3 PTS = Columbus used all 3 first-round picks on forwards in 2013 and all 3 have saw NHL time in 2014, albeit necessitated by a rash of injuries. Rychel is having the most immediate success of that trio and might stick around the longest as a result. Sven Andrighetto (F Montreal) — 1 GP, 1 G, 0 A, 1 PTS = First game, first goal. Not a bad start for a little known third-rounder from Switzerland. He’s little at 5-foot-9, but he’s got speed to burn and a real slick skill-set, so it will be interesting to see how long he can hang around with the Habs. Marko Dano (F Columbus) — 8 GP, 1 G, 1 A, 2 PTS = Another of those 2013 first-rounder, along with Rychel and the aforementioned Wennberg, Dano’s since been sent down to the AHL where he has 3 goals and 6 points after 13 games. Andrej Nestrasil (F Carolina) — 14 GP, 1 G, 2 A, 3 PTS = Detroit developed him before the Hurricanes claimed him off waivers. He’s since added another assist, but it’s tough to tell what his top-end potential will be. Taylor Beck (F Nashville) — 16 GP, 3 G, 2 A, 5 PTS = He’s also added another assist and might be staying in Nashville this season after spending most of the last two campaigns in the AHL. Like Nestrasil, he’s a bit tougher to get a read on in terms of offensive upside. Cedric Paquette (F Tampa Bay) — 11 GP, 5 G, 0 A, 5 PTS = He turned some heads in last season’s playoff loss to Montreal but was expected to get lost in the Lightning’s numbers game again this season. That was the case out of training camp but after putting up 4 goals and 7 points in 5 AHL games, he got called up and has been chipping in from a bottom-six role. Liam O’Brien (F Washington) — 12 GP, 1 G, 1 A, 2 PTS = He was an undrafted training-camp invite that was supposed to be a QMJHL over-ager this season. But he earned a contract then forced his way onto the Capitals’ opening-night roster as a 20-year-old. He had been a healthy scratch a fair bit lately and was just assigned to the AHL, but his impressive feats cannot go without mention. Brandon Kozun (F Toronto) — 5 GP, 0 G, 1 A, 1 PTS = Speaking of shockers, he was one of the last guys anybody expected to make the Maple Leafs’ opening-night roster, especially with how many NHL-calibre forwards Toronto had in training camp. But he stole the show and was rewarded, only to suffer a high ankle sprain that sidelined him until just recently. Stuart Percy (D Toronto) — 8 GP, 0 G, 3 A, 3 PTS = He was somewhat of a forgotten former first-rounder (from 2011), but he’s back on the radar now. He looked pretty darn good at times during this call-up, even manning the point on the Leafs’ top power play. But oddly enough, he’s pointless in 8 games with the Marlies since being demoted again. Calvin Pickard (G Colorado) — 2 GP, 0 W, 3.65 GAA , .889 Save% = Ignore those numbers as his emergence happened after the 20-game cutoff. He’s since earned 3 wins and improved his GAA to 2.49 and save percentage to .922. There is a decent chance he’ll unseat Reto Berra as the Avalanche’s backup behind Semyon Varlamov at some point. Scott Darling (G Chicago) — 3 GP, 2 W, 1.98 GAA , .933 Save% = Ahh, it appears I unintentionally saved the best Rookie Sleeper for last. He really came out of left field this season but he’s looking pretty legit so far, having just notched his 3rd win on Saturday night, stopping 32 of 33 shots to beat Nashville. That boosted his save percentage to .943 while lowering his GAA to 1.74. With starter Corey Crawford sidelined for a couple weeks, Darling will split time with regular backup Antti Raanta.